THE WONDERFUL ORISHAS OUR GUARDIAN ANGELS! Orishas are deities that reflect the manifestations of Olodumare (God). They are emissaries of God, forces of nature. Each individual manifest an attribute of these forces within their consiciousness, therefore displaying knowingly or unknowingly which Orisha is their Guardian. In other words we are all children of Orishas. We in the west are used to hearing about Angels and we have no problem with that, in fact it fills us with joy, warmth and happiness to call upon Gods angels to come and assist us in whatever. It is the same with Orisha only more personal, and that the language used is different in connection with the deity upon our Ori which is our head. It is through our head (ori) that we manifest the Orishas, and we can communicate with them through divination,offerings and prayers. Orishas were sent to earth by Olodumare (God) to assist man and to align things so that we can put them in the right prospective (order), this is the way I have precieved it from my point of view. They were here from the time of creation, and may be called by many names depending on time and place, they are intermediaries to God, much like Jesus is to the christians and Mohammed is to muslims. Whenever there is a problem a Babalawo (priest of Orunmila) is consulted for the proper solution. Orunmila who is also refered to as Ifa (which is the divination system used by Bablawos and owned by Orunmila), knows everything. The story is that when man is being prepared to be sent to earth they chose their own destiny in the sight of God (Olodumare) and it is witnessed by Orunmila, so he knows what the destiny of every living human being is, what problems they will face while on their journey on earth and what is the solution to those problems, hence the importance of divination, where Orunmila can be accessed through his Ifa system of divination. 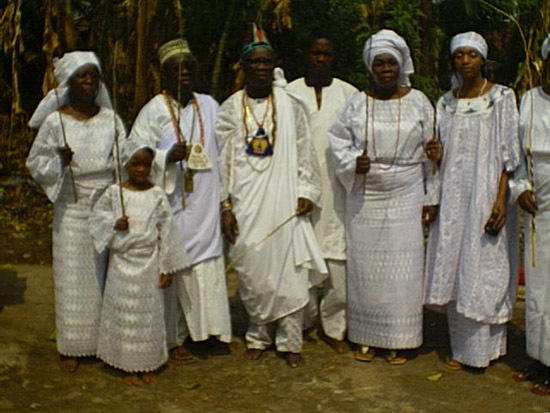 Obatala is known as father of creation, he was given the task by God to mold man from clay, he is known as the kindly father, he represents peace and is the owner of all our heads, he is old and very wise, his color is white. He is a very helpful Orisha and is highly respected by all. Ogun is the diety that represents Iron, in nature iron is found as a natraul element, Ogun is a great warrior and clears the way for human being in life with his machete, so that we are able scale over obstacles that may come before us. His color is green. He is in constant company with Esu. He is the Orisha that rules over technology. Yemoja/Olokun represents the ocean (in Africa (Nigeria), Yemoja and Olokun are river deities and are seperate deities, however, it is said that Yemoja and Olokun accompanied her children through the ocean to the diaspora, and therefore is worshipped there in the ocean). The top of the ocean is Yemoja which is a feminine energy and the bottom represents Olokun which is a masculine energy. Yemoja is sister to Osun and loves all her children and protects them fiercely. Yemoja is protector of children and pregnant women she is very compassionate but when she is crossed her rage is uncontrollable. She is big mommy!. (when I was pregnant with my last child and going through hell with the wicked baby father, I dreamt Yemoja coming out of the ocean and saying to me “pray and call upon me seven times and I will help you, and she surely did). Olokun has all the wealth of the world in the bottom of the ocean with him, Tsunamis are attributed to Olokun being angry with us. Their colors are blue and white. Sango represents lightning and thunder. He is the Only Orisha that was once mortal man and was made Orisha by God after his death which was by suicide. He was king of Oyo state Nigeria. He was loved by all, but was a known womanizer, having his wife and several concubines, he is one of the most popular Orishas besides Osun. I personally have a crush on Sango for lots of reasons. He is very masculine and an unbeatable warrior. His color is red. Oya, Sango’s natural wife is Orisha of the winds. She represents tornadoes, and she owns the gates of the cemetary (owner of the cemetary according to Lucumi tradition, not said so in Africa, but I figure because cemetary equals death and death equals change and she is the Orisha of wind, tornado, and change, this may be where all of this configures). Oya is a fierce warrior and she walks before her husband Sango, that is why the wind is heard before lightning and thunder. She brings about swift changes, some good and some that will make you take a deeper look into your life and adjust it to allow you to grow. Her color is maroon. Oya like Osun and Yemoja wears a mask and is very mysterious. At initiation she sometimes will grab the head of any of these two Orishas children., especially that of Yemojas. These are only a few of some of the Orishas, and just a small explanation of their attributes. I will be slowly introducing you to them as they are very much a part of ALL our lives, not only those in Africa. We have just forgotten them, but THEY have not forgotten us. You know what funny. .well not funny..haha funny, but cool funny, I was saying to myself I don’t understand anything about the Gods of the Yoruba religion. .I attempted to look it up online but I just didn’t know which information was accurate. .and as usual Mi Teacha.. come through..thanks for this information mi ago save it so mi can keep reading it until it fully stick..aka studying. .. I actually find myself praying to Osun and Ogun respectively and not sure why..but now I kinda do.. Thanks again Teacha. .aka Miss.aka Obara Meji. .
Amazon discount code tries to give you widest number of promotional codes on internet. and cut your own deal. This discounts are designed to keep regular customers coming back. 2. So within the ifa Olodumare is not the highest form Orunmila is and it is of a male energy?